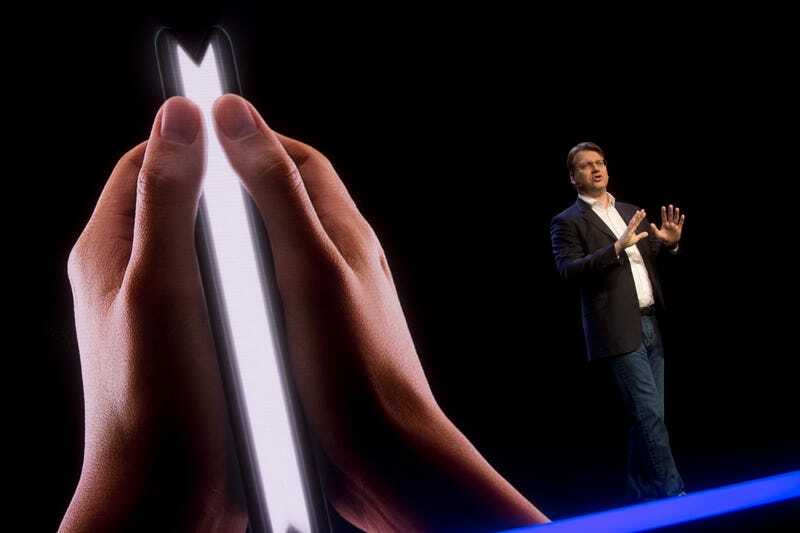 Last week, Samsung teased its Infinity Flex Display for use on a still-unnamed folding smartphone. Samsung’s project isn’t the only bendy-screen device in the works, but reports from two Korean news agencies already have people balking about the gadget’s anticipated price. That’s because Samsung’s flexible screen device – which has been dubbed the Galaxy F for now – may cost around 2 million won (about £1,350) when it goes on sale in the first half of 2019, according to an estimate from Golden Bridge Investment published by the Korea Times. That price may come as a major downer for people who have been searching for alternatives to the boring glass bricks we’ve been living with for the past decade or so. But if you consider the state of smartphones today, 2 million won doesn’t actually seem that outlandish. Even if you completely ignore all the work Samsung has to do to make a super thin, flexible display that can resist the wear and tear of everyday life, in addition to much of the software powering that tech, consider Apple’s iPhone XS Max for a second. That thing starts at £1,100 (£100 more than a base iPhone XS) and only offers a single, 6.5-inch 458 PPI OLED display and 64GB of base storage. 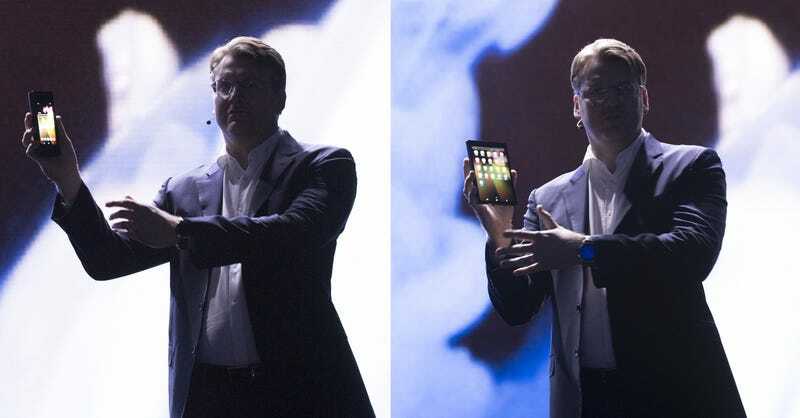 A photo of Samsung SVP Justin Denison holding the company’s Infinity Flex Display at last the Samsung Developers Conference last week. Meanwhile, although Samsung hasn’t confirmed a lot of details about the Galaxy F, we do know that it will have two screens: a smaller 4.58-inch 1960 x 840 display on the outside that Samsung is calling a “cover screen,” and a tablet-sized 7.3-inch display on the inside, with both screens offering a pixel density of 420 PPI. Going by traditional smartphone pricing schemes, the Galaxy F’s large interior display is worth at least $100 over the 6.4 or 6.5-inch screens in a Note 9 or iPhone XS Max, while the presence of a separate, second screen could account for another Benjamin. Then toss in another up-charge, because if the Galaxy F’s specs are anything like the Galaxy Note 9, it’ll probably feature at least 128GB of onboard storage, which is double what you get on a base iPhone XS. Suddenly, we’re looking at a phone that could reasonably cost £1,400 in today’s market. The better question is if you would actually pay that much to test out an innovative form factor like this. For most folks, the answer will be no. And that’s just fine, because Samsung probably isn’t going to make much money on its first flexible phone anyways. Based on all the R&D that went into its Infinity Flex Display and the simple newness of the tech (and all the uncertainty that comes with it), even if the Galaxy F gets released in mass quantities (which isn’t a guarantee), Samsung’s flexible phone is still going to be a major loss leader. The point of the phone is to explore a new way to make a phone, and then use that info to refine the experience for future bendy devices. Even with all the refinements that typically go into Samsung phones, the Galaxy F will likely always feel a little bit like an experiment. There’s only so much testing you can do behind closed doors before you need to see what the rest of the world thinks. The Galaxy F is about potential, and until we know more about the rest of its specs and what that flexible screen is actually like to use and live with on a daily basis, it’s way too early to be anything more than optimistic. What we learn from Samsung’s upcoming device could lead to completely different applications of this tech, like smartwatches where the entire band is a screen. Or more simply, the Galaxy F could completely eliminate the need for people to own both a phone and a tablet. That alone might be worth just shy of £1,400 – maybe not now, but sometime in the not-so-distant future.